On a recent Sunday night at Brookland’s Jazz and Cultural Society, Dr. John Lamkin II piped luscious, honey tones from his trumpet, propelling his quartet through Miles Davis’ “Seven Steps to Heaven.” Trading crisp solos, the group of dapperly suited musicians went on from there to play a range of jazz standards, electrifying the intimate, amber-lit room, which quickly reached standing-room-only status. 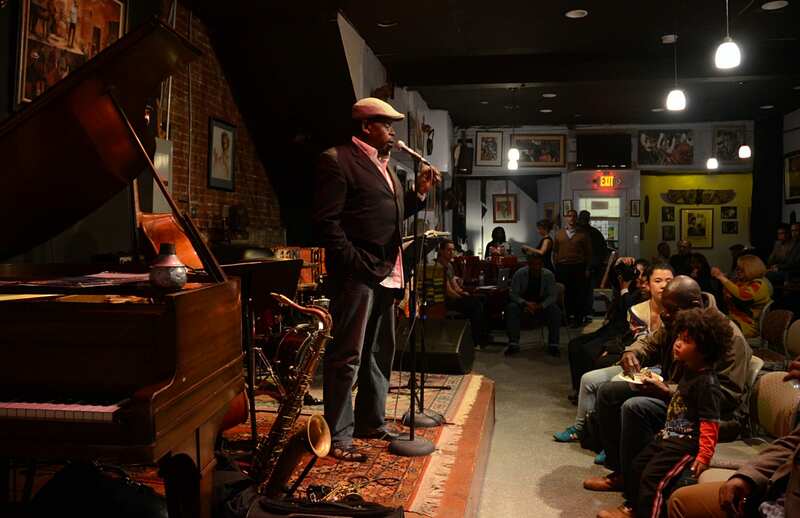 When the band wasn’t playing, the venue’s energetic host and manager DeAndrey Howard entertained audience members with comedic tales about the featured musicians, all of whom he’s known for decades. 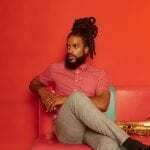 In an interview after the show, he said the Jazz and Cultural Society, or JACS, presents “the kind of music that makes you tap your feet, pat your neck, and put the hump in your back. Anything other than that is uncivilized,” he joked. 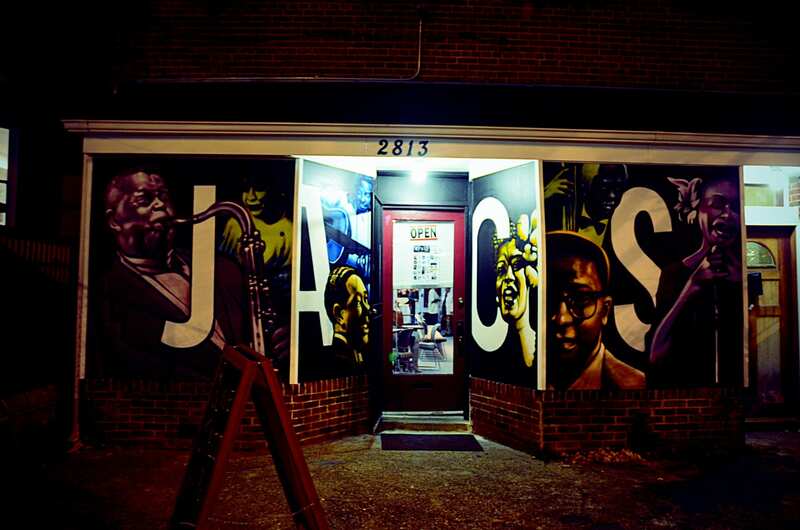 JACS, located on 12th Street Northeast, just a few blocks north of Rhode Island Avenue, started presenting concerts in June, and has been quietly gaining attention from jazz die-hards as an authentic home for straight-ahead jazz. Run on a shoestring budget, the club is both raw and elegant, and it often features veteran musicians who’ve played across the globe. A professional musician himself, Howard created the club to showcase pretense-free performances—a standard he says is often unmet by venues run by promoters. Admission is only $5. 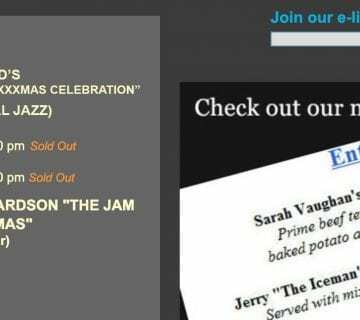 “I can’t think of too many places, especially jazz venues, that are run by jazz musicians. This three-dimensional experience proves that jazz still lives,” said drummer Jesse Moody, who played in Lamkin’s quartet that evening. 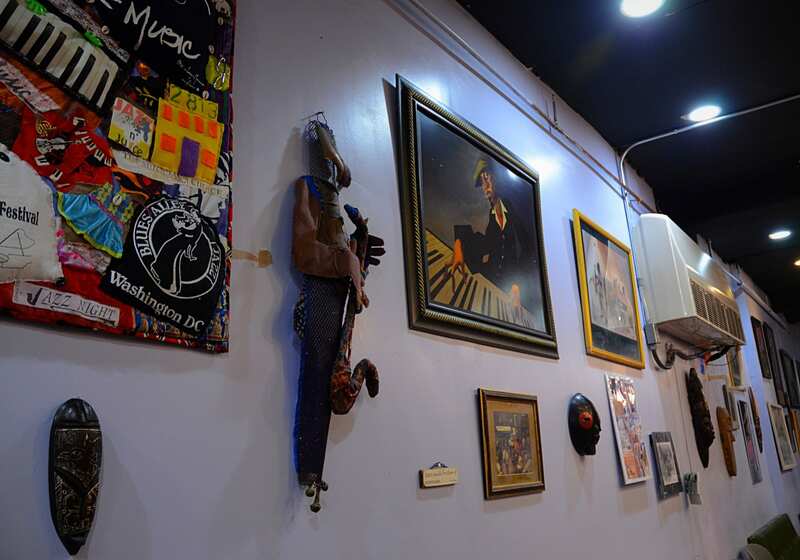 A collaborative effort between Howard and venue owner Dr. Alice Jamison, the venue is a heartfelt tribute to the foundations of jazz music as a community-building art form. 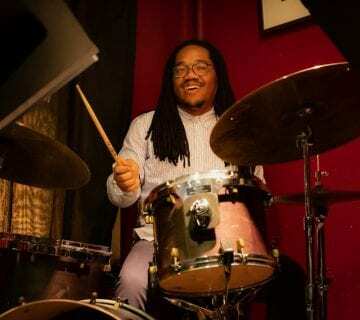 The Jazz and Cultural Society hosts shows every Wednesday and Sunday night, and occasionally on other weeknights—because, as Howard explains, on Fridays and Saturdays he often has his own gigs to play at other clubs. The venue makes a distinctive first impression: Its storefront is adorned with a remarkable mural, rendered by artist Ricardo Gomez, featuring images of jazz masters like Ella Fitzgerald, Billie Holiday, and D.C.’s own Buck Hill, Ronnie Wells and Bill Harris. The club’s interior delights with framed paintings, sculptures from Dr. Jamison’s and Howard’s expansive collections, and a custom-built stage and sound system. “JACS makes my heart pound because I’m so happy. When I think about it, it’s exactly how I wanted it to be,” Jamison said. Brookland is a historically remarkable neighborhood, full of special contributions to jazz and other aspects of Black culture in D.C. Though its demographics are changing, the Jazz and Cultural Society carries an important cultural torch. Brookland also remains home to such preeminent jazz musicians as Brian Settles, Andrew White, and Donvonte McCoy. 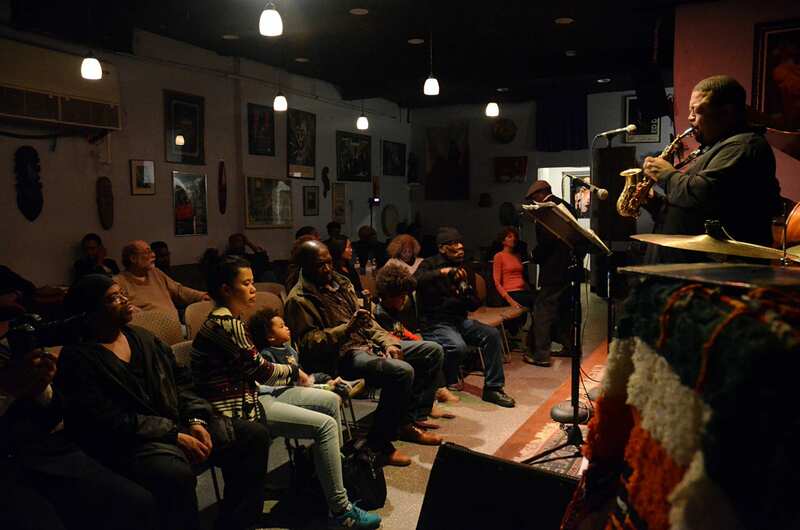 The Jazz and Cultural Society carries jazz forward from its perch only a few blocks from the home of late poet, critic and educator Sterling Brown. The Jazz and Cultural Society showcases consistently captivating performances. On a recent Wednesday, songstress Sharon Clark delivered heartfelt, tear-jerking standards. 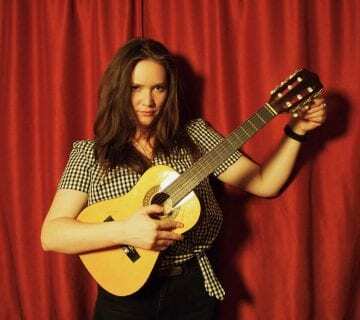 Her rendition of “(I’m Afraid) the Masquerade Is Over” demonstrated her glorious vocal range and her gift for transporting listeners into a story of lost love and unrelenting heartache. 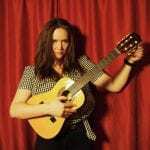 Clark’s velvety timbre expressed the throes of love’s newness, anticipation and fluttering butterflies, as she sang “On the Street Where You Live.” Throughout her two sets, audience members were drawn to their feet for repeated ovations and cheers. Sundays are often reserved for bands that make use of the club’s Hammond B-3 organ. Performers have included vocalist Shirletta Settles, tenor saxophonist Elijah Jamal Balbed, keyboardist Todd Simon, and bassist Les Biles. Howard, a native Washingtonian, began playing music at age 14. He is skilled at the trumpet, harmonica and drums, and often guests as a blues-shouting vocalist with the bands that play his club. Howard and his brother, Joe, grew up performing in countless venues around town. DeAndrey’s decades-long career as a sound engineer, musician, business owner and carpenter has prepared him for a major undertaking like this one, making him ready to actively cater to the many needs of a music venue, its audience and its performers. 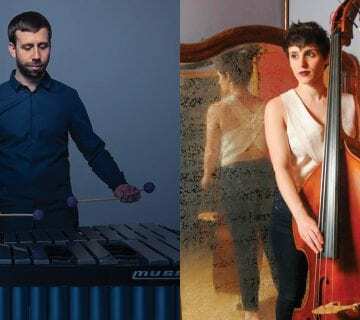 Howard and Jamison had known each other in passing for sixteen years, when Howard performed at Westminster Presbyterian Church as a featured jazz musician. As fate would have it, their paths again crossed in 2010, when Jamison was tending to a storm-damaged property she owned on 12th Street. Howard’s sister was passing by and observed the broken glass and building in need of repair. She phoned Howard, who lived nearby, for assistance. Upon Howard’s arrival he recognized Jamison from Westminster. Their reunion would ultimately change both of their lives. Jamison remembers Howard surveying the building and getting a sense of its needs. He suggested that it should be a jazz hall, and a partnership was born. Five years of consistent dedication later, the Jazz and Cultural Society had its remarkable debut this year. “I’ve talked about opening a jazz club since I was 29 years old. 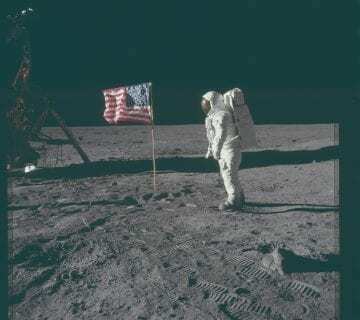 When I saw the place, everything felt familiar—like I spoke it into existence,” Howard said. 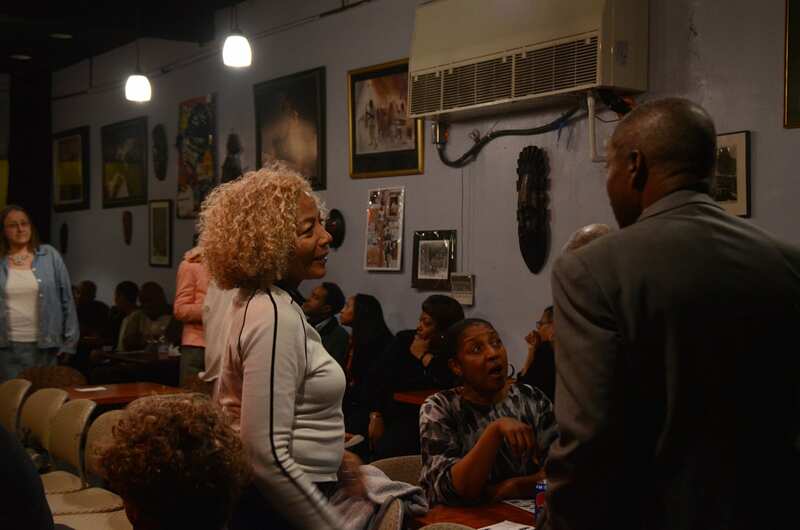 The Jazz and Cultural Society’s namesake evolved during a conversation about the new spot between its co-proprietors. Akia Quander-Jordan, Howard’s friend and fellow artist, chimed in with a suggested name. Akia—who’s also known to friends and associates as the Space Lady—designed Parliament Funkadelic’s costumes, among many other projects. Between sets, when Howard plays the role of jovial MC, he often introduces the audience to volunteer staff, who assist in logistical and technical support such as providing security and tuning up the organ. As the club continues to serve the community, both Howard and Jamison are mindful of its diverse patrons. JACS provides only non-alcoholic beverages, which reinforces its sole focus on music. 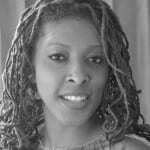 Jamison, a psychologist, said that throughout her career she has specialized in addictions, and often interacted with clients with substance abuse challenges. Their social interactions can be impacted where alcohol is served. Rather than create a possible compromising situation for people in such conditions, the venue has chosen to forgo serving alcohol. “It’s wonderful for all people who are interested, and come for the music,” Jamison said. When asked what’s next for JACS, Howard and Jamison assert that they’re just getting started. Additional offerings will include a youth jazz program for young musicians and an evening of poetry. 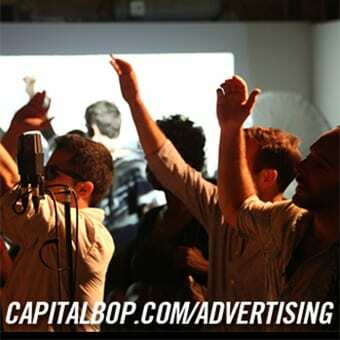 They also plan to offer Afro-Cuban jazz and blues performances in the near future. 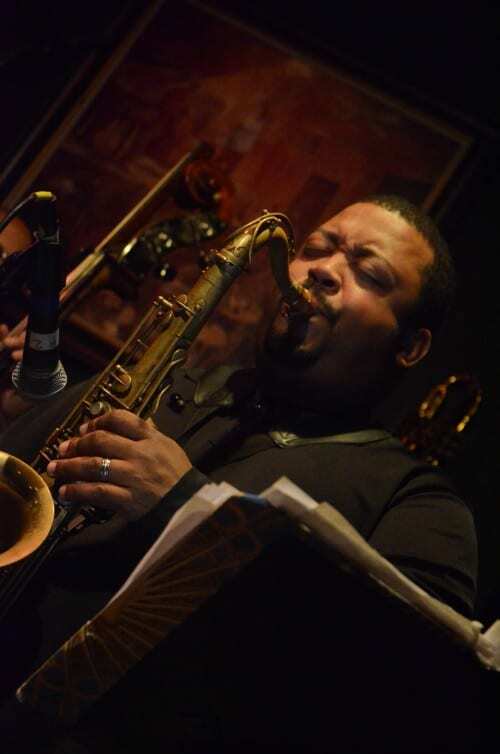 With a focus on quality music and entertainment, the Jazz and Cultural Society allows audience members to experience Washington D.C.’s rich jazz tradition in a distraction-free, authentic setting.